Recently, we sat down with Livermore Optometry Group's Dr. Steven Faith to talk about their approach to online retail, and how they discovered that online browsing was actually driving their in-store sales. Frames Data: Hi Dr. Faith, Thanks so much for chatting with us today. Why don't you start by telling us a little bit about your practice? Dr. Steven Faith: Livermore Optometry Group was established in 1947. We are a single location in the San Francisco East Bay, 40 miles east of San Francisco. We have 7 doctors and 30 staff members, so we have the ability to offer patients extended hours of availability and a complete suite of eyecare services. We also have a VSP certified onsite finishing lab that allows us to maximize our quality product service and control turn around times on ophthalmic lens orders. Since we are in a very high tech region here in northern California, our customers are generally very technically savvy. That's why we've integrated as much social media, electronic communications, patient efficiency processes and advanced diagnostic technology as is currently possible. FD: What are some other examples of technology you are using in the practice? Dr. Faith: First of all, as a result of electronic communication technology with 4PatientCare, we have a 90% patient return rate within 3 months of the doctor directed recall date. Also, we can direct ship over 75% of our contact lens orders directly to the patient from ABB Optical, and we can also process direct to consumer contact lens orders through our website with MyEyeStore. We have online payment options with our Well Fargo Merchant Services vendor...and now we have a comprehensive online eyewear inventory through My Frame Gallery. "If we went over that 60 minutes they were spending $39 less for every 10 minutes they were there." FD: That's a robust mix of services. Why did you decide to add My Frame Gallery? Dr. 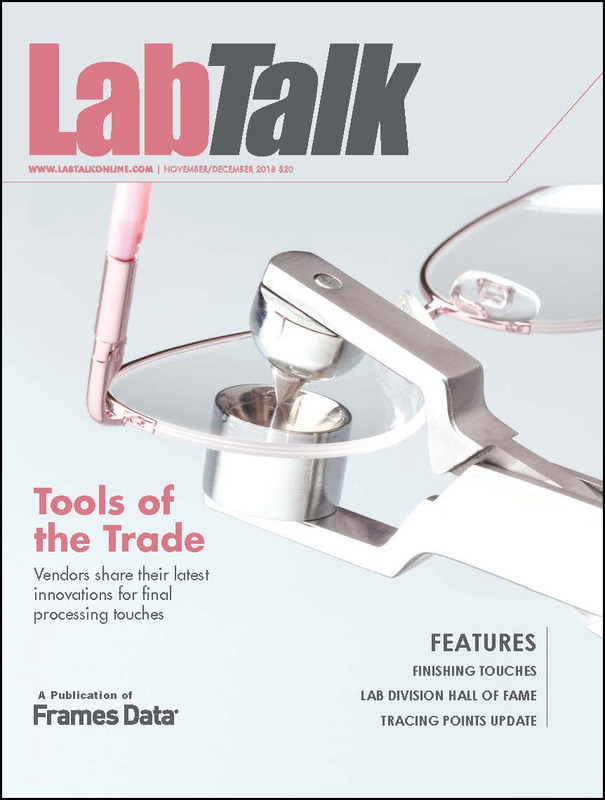 Faith: A number of years ago, using data from Jobson's Research department, as well as our own research, we evaluated our patient consumer demand for frames and name brands. We found that 60% of our patients requested a "House Brand" style of frame that did not have a particular premium name brand associated with it and was not more than $40 to $60 over their vision plan benefits. 20% were looking for the "inexpensive", "spare", or "after contacts glasses" and 20% were looking for a premium brand and cost was a secondary concern. After working with OD Lean [a consulting group, now defunct], we determined that our patients wanted their in-office experience to last no more than 60 minutes. If we went over that 60 minutes they were spending $39 less for every 10 minutes they were there. FD: That's incredible...a very valuable discovery to make. Dr. Faith: Yes it is. So then the question became "How could we enhance their office experience by shortening their time in our office?" And the answer that presented itself was that by encouraging them to shop online at our website before their visit, they would get an idea of what they liked before they came in. Our styling team could then be much more efficient with the patient when knowing what types of frames the patient was interested in seeing. As an example, we were one of the first independent offices in the country to have Ray-Ban on our website as a test for Luxottica. Though our online website sales of Ray-Ban did not increase during our testing time, our in store purchases of Ray-Ban were up 500% during the same time period. That sealed it. We needed to focus more attention on our online store and Frame Gallery. FD: So you could then draw the conclusion that the website, which did have product available for sale, was actually driving foot traffic to the store. Dr. Faith: Right. So for the practices out there that are worried about showrooming, that hasn't been our experience at all. FD: Switching gears now, how would you describe the set up process for My Frame Gallery? The set up was very easy and only took a short time with a single staff member doing the initial work and installation. Now we have a couple of staff monitoring appropriate adjustments to our My Frame Gallery inventory as our needs and product lines change. The time for these adjustments has been minimal, and now that we're going to enable the auto update feature, Frames Data is going to do most of that work automatically. We're only going to make changes when we add or remove brands. "...for the practices out there that are worried about showrooming, that hasn't been our experience at all." FD: How are you using My Frame Gallery to impact your business? What have you heard from patients? Dr. 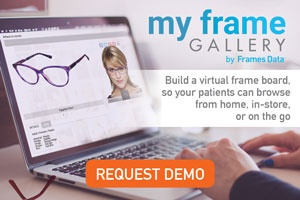 Faith: As I mentioned before, our intention is not to merely drive online sales through our My Frame Gallery but to offer patients a better and more efficient experience through our office. Patient comments are not frequent but they do appreciate our technology driven website with a frame inventory that is second to none in the independent practice genre. Also, My Frame Gallery monitors our website metrics as a part of the monthly service, so we can see directly how often, how long and what the patients are looking at in the Gallery. We have actually used this data to change the product mix in our physical store. FD: We just added a new Wish List feature to My Frame Gallery, will you be adding that to your site? Definitely. We are in the process of implementing it now and expect to have it in place soon. It's perfect for our application of My Frame Gallery. It's another tool to help us shorten the length of the visit, and help get the patient what they looking for quickly. FD: That's great! We'd love to check back with you again once you have Wish List up and running. FD: Well thanks again for your time today. I look forward to checking back in once you've fully implemented the Wish List!